The UK celebrates Christmas with over-zealous gifting and drinking, and Easter with indulgence in chocolate but is otherwise mostly bereft of national celebrations, saints’ days or festivals. That yawning chasm tends to be filled with sporting events that become fixed points on the calendar: the FA Cup final in football, the Grand National and in horse racing, Six Nations rugby and, at least as big as any of these, tennis at Wimbledon. If you arrive at Wimbledon’s overground railway station and walk to the All-England Lawn Tennis Club (AELTC), you will pass through tree-lined streets of expensive properties before descending to the forest green and purple livery of Wimbledon. Attending the annual pre-tournament IBM press event means you get to see some of the primping and polishing that goes on beforehand. A man buffs a gate for invisible specks of dust, a dozen or two others position a thousand trays of ferns, lilies, pansies and other plants. But the real reason we’re here is to see what technology treats Big Blue and the All-England folks have concocted this year. That’s because Wimbledon has become one of the finest exponents of digital media and an example of how technology can augment and enhance a powerful brand without making it tacky or gimmicky. Part of the reason lies in consistency: the same team has been together for several years at these events. All-England’s commercial and media director Mick Desmond, head of communications, content and digital Alexandra Willis and IBM client executive Sam Seddon have worked together for several years and it shows. They share a common desire to enhance the Wimbledon fortnight every year without selling out what makes it special. An example of that disruption came last year when Wimbledon’s vast website audience declined slightly in the face of competition from UEFA European Championship football. Desmond, a former ITV executive, is also acutely aware that viewing habits have changed so the catch-up is just as important as the live offer. Means of consumption are also changing: in China the tournament is watched more via digital media than TV. Wimbledon’s digital presence is deep, broad and exquisite in appearance but the private members’ All-England club remains conservative in some ways. “We don’t want to be at the bleeding edge but at the leading edge of innovation,” as Desmond puts it. Still, he realises the importance of gaining a wider, younger and more engaged audience and is fully aware that there are plenty of other attractions in the world that are vying for attention. 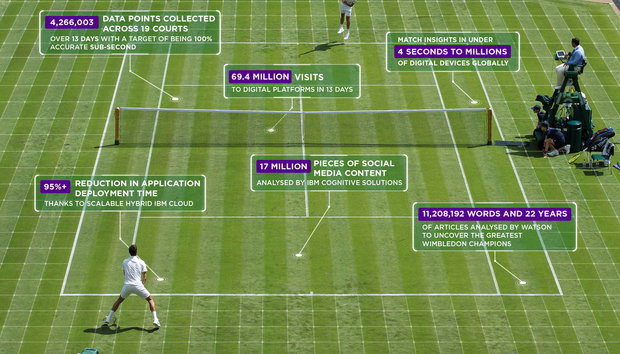 But a lot of the work at Wimbledon is aimed at improving the understanding of the game’s subtleties, making it at good match for IBM Watson’s data crunching and analytics. His colleague Willis adds: “You can be digital and beautiful at the same time. All the platforms are in a good state and they have beauty at their core. This year’s enhancements include extensive use of augmented reality. IBM’s Watson technology will be used to identify celebrities in the crowd and players on practice courts and to tag them and their practice partners. Watson has also been trained to recognise increases in crowd noise, gestures such as handshakes to recognise when games have ended and facial gestures of triumph or despair to auto-generate highlights. An Ask Fred virtual assistant (named after Fred Perry) will provide answers and the SlamTracker scores and insights feature will provide analytics data even before games begin while Competitive Margin will assess the number of forced and unforced errors and point viewers to interesting if less heralded games aside from the show courts. The aim is to provide plenty of fodder for data geeks but also useful information for the casual fan. Social media have been updated with deeper support for Instagram and Snapchat stories, Snapchat lenses, Twitter emjois and Facebook frames while content is now specifically available in Korean and Spanish and with extra content in English for the Indian audience. Video has been extended and the Wimbledon Channel will now roam around the village. The BBC, Fox in Asia and ESPN for the Americas remain partners but video is also surfaced on YouTube and the Club is working with Twitter on more. Perhaps most notable is that for the first time Wimbledon will add WiFi in three zones as what Desmond characteristically downplays as “a learning experience”. You suspect that if wireless turns visitors into screen-obsessed information junkies then the project will be scrapped. This is Wimbledon after all: open to change and improvement but hugely protective of its brand values and status as national institution.